Viet Nam is one of EIGHT leading coconut planters, producers and exporters in the world. And we are Viet Delta Industrial Co,.Ltd one of among strong and largest coconut producers and exporters in Vietnam with more than ten year experience. We have exported our coconut products to many countries like Canada, USA, Argentina, France, Spain, Egypt, Iran, Singapore, China, Hong Kong, Taiwan, and Australia. 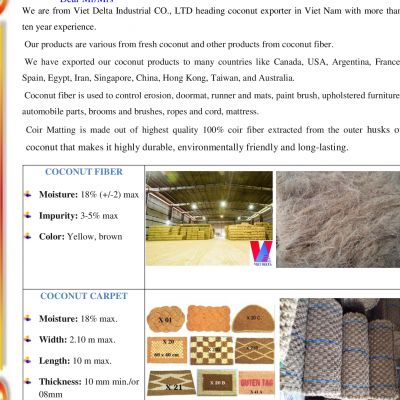 In Viet Nam, coconut fiber (coir) is raw material which is easy to find with the cheap price and good quality. We hope our company will be one of your suppliers coir mat/ coir net. With available raw material around year and cheaper labour, we believe we can offer your company the best price (The cheapest price) in the world.